Chain Conveyor is a widely used machine in paper pulping process, since it has the advantages of large working capacity, simple construction and applying to a lot of raw materials. It is mainly used for conveying the waste paper or pulp board into hydrapulper, and it can also be equipped behind Drum Pulper to convey the pulped material. 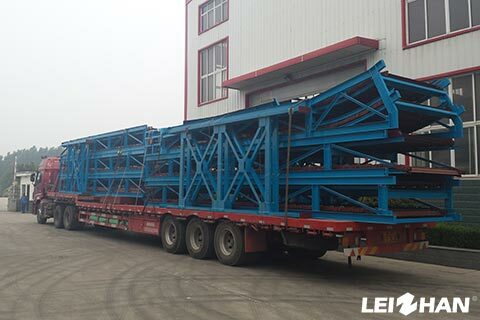 Chain Conveyor has five main parts: head, inclined section, concave curved section, level section and tail. Transmission is equipped in the head, and it includes a rotor and a reduction gears, which can adjust the conveying speed. The concave curved section can make sure that pulp board or waste paper can placidly be transported. 1. One-time impact stamping chain drive, which is firm and durable with strong ability of impact resistance. 2. Chain Conveyor is equipped with reduction gears, high safety factor. 3. V type backplates on the two sides improve the conveying capacity, make sure impurities won’t slip to the wheel. 4. There are device to adjust the degree of tightness of chain board in the tail. It can avoid the phenomenon of derailment. Leizhan provides various kinds of pulp and paper machine, welcome to contact us for more details.